Frankincense Frereana-Freshly distilled Essential Oil in Separatory funnel. As mentioned in earlier posts, Frankincense Frereana is a relatively rare type of Frankincense in the West. Both the resin and good quality essential oil are difficult to find and much more expensive than other Frankincense types. Despite these drawbacks, or perhaps because of them, it is well worth experiencing at least once. Boswellia Frereana is native to the mountainous regions of Somaliland, the Somali Puntland and to a lesser degree westward through Kenya. Though it has been transplanted to Yemen and possibly Oman over the generations, it is not indigenous there, nor can it supply local demand. 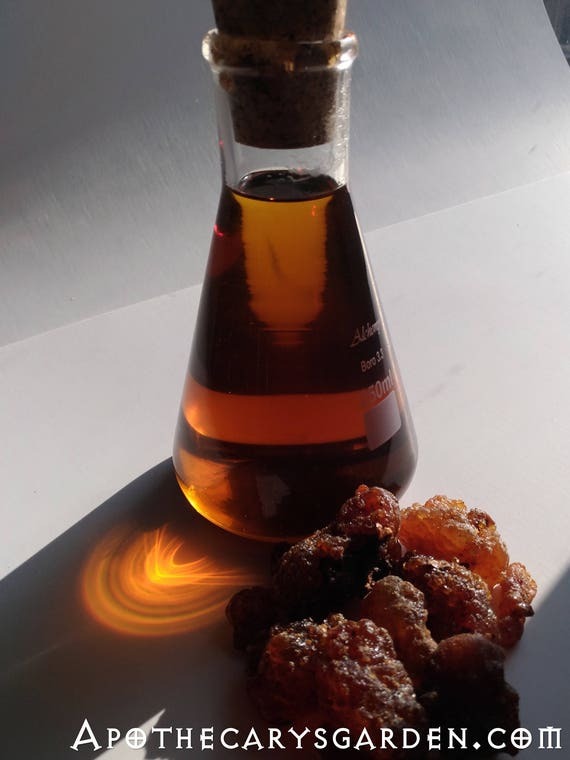 Most of the Frankincense Frereana essential oil that is sold as Arabian is purchased in Somaliland and Somalia and distilled in countries across the Red sea which are more economically developed. Not as prolific as the well known Frankincense Sacra/Carterii, it is used by the well to do in Arabia as a high-end chewing gum, in cosmetics, perfume and as incense. Though culturally important, due to the demand and high price, harvesters often keep only the lower quality scraps and leftovers for their own use since resin sales provide their income and sustenance for the whole year. Translucent and golden, B. Frereana resin could very well be the gold that came as a gift along with Frankincense and Myrrh in scriptures Also called Coptic Frankincense, and Yemenite chewing gum, the oleoresin of Boswellia Frereana is used extensively as incense, alone or combined with other ingredients. A traditional Somali incense “Amber” called Unsii is prepared from Frankincense Frereana and other aromatics according to local and often secret family recipes. Frankincense Frereana is traditionally used for oral care, peptic ulcers, and considered antiseptic and anti inflammatory for both the gastrointestinal and the urinary tract. It is believed that the body benefits from these therapeutic actions through use of the essential oil and chewing the raw resin. Externally, Frankincense Frereana is considered excellent for joint inflammations and mature skin, making it ideal in rejuvenative and anti-aging skin products. From an aromatherapy perspective it is uplifting and a restorative, calming to nerves and emotions. It helps attune the mind and heart to meditative and spiritual/religeous practice. 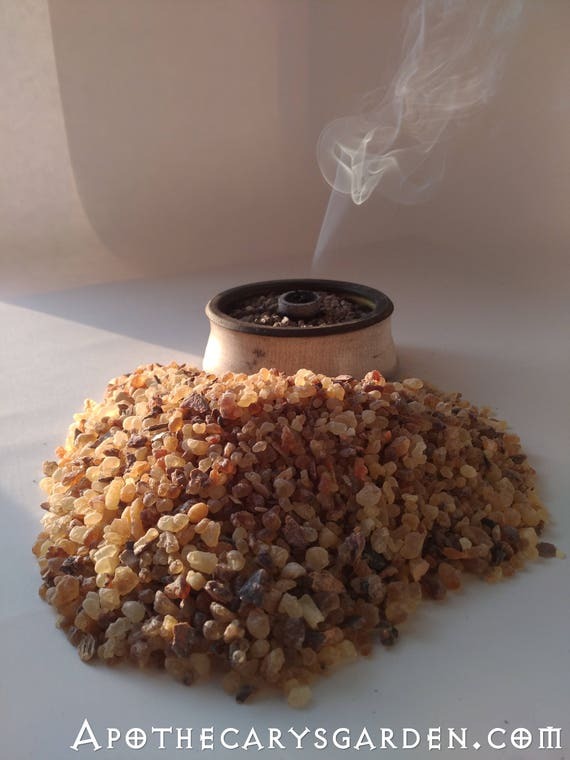 Possessing a warm, amber scent with hints of honey, candy, spice and resinous wood, Maydi, as it is called locally, is one of the most distinguished members of the Frankincense family. Similar to Our Pine Spruce and Fir saps, Elemi, Mastic and Copal, the hardened sap of Boswellia Frereana, is a pure oleoresin. 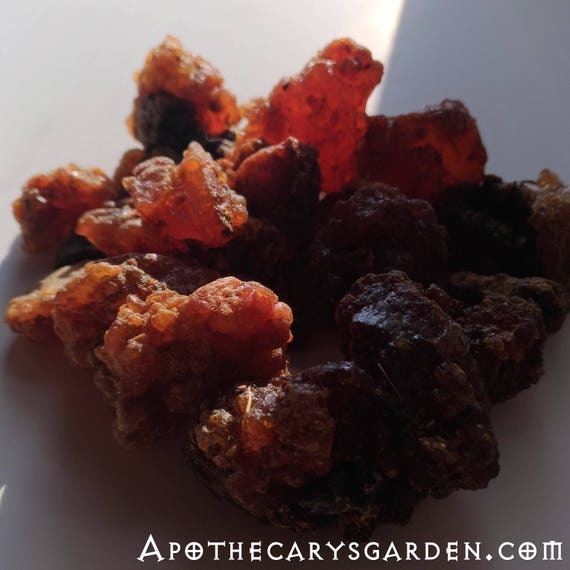 Unlike most other types of Frankincense, it has little to no water soluble gum, only resins and volatile oils This distinction gives it, and all the aforementioned oleoresins some unique qualities. They all dissolve easily in alcohol and warm vegetable oils which makes them ideal for use in cosmetics. They burn as incense on a coal or heater in a clean and most fragrant way, leaving little to no residue. They can all be hydro distilled directly in the water with little fear of scorching or burning. They yield a relatively high percent of essential oil which makes extraction of essential oils viable with a non-commercial sized home still. Between 5% and 10%. Much higher than most other essential oil sources. After distillation of their essential oils, they leave behind excellent rosins with many therapeutic properties and practical applications. I believe they can all be “dry distilled though I need to confirm this by trying it. In this particular distillation I used a relatively small 21.5 liter pot still, which is easy to make at home. You can find instructions in my post “How to build a kitchen still for essential oils at home. It is eminently suitable for hydro distilling essential oils from oleoresins and other high yield materials at home. With the inclusion of a suspended basket, its capabilities can be extended to accommodate a wider variety of materials through steam distillation. The practical elegance of this particular design is due to the thick bottom and milled seal of the lid which makes it a hassle-free apparatus. Its moderate size allows one to distill sufficient quantities for personal use and small scale production. There is a 40 liter model on the market for those who wish to expand their distilling practices further, though the larger model is more difficult to come by second hand. This is a good still to start with. Solid and versatile it makes it easy for anyone to explore the ancient art of distillation. Frankincense Frereana Hydro Distillation. Grinding the oleo-resin. 3 kilograms coarsely ground oleoresin of Frankincense Frereana. Though I felt it was uncomfortably close to the top of the still, I started with a gentle, moderate temperature, to avoid forcing material over into the receiver. I used an Allihn condenser, but a straight tubed Liebig condenser would have worked just as well. I ran this distillation for 10 hours, 2 hours longer than I would normally, to extract more of the warm amber notes from the resin. Years ago I purchased essential oil of B. Frereana from a large and well known company and was greatly disappointed in the quality. It smelled more like cleaning fluid than Frankincense. Sometimes you have to do things yourself if you want them done right. I am very happy with this distillation. Amber with honey, a touch of black pepper and ginger, with a hint of sweet lemon candy. It is warm and uplifting, drying down to a musky, woody and sensuous soft amber. The scent of Boswellia Frereana essential oil properly distilled from good quality fresh material, is heavenly. One can see why it is called “The king of Frankincense”. One of the perks of distilling your own essential oils, is that after separating the volatile oils, you can add the distillate to your bath. (Or make a cold creme?). A half liter of the distilled waters of Frankincense Frereana in a hot bath caressing you, is truly a rare and exotic treat. Calming, uplifting, soothing, grounding, sensuous and stimulating. Did I mention all the Frankincenses are ruled by the Sun and considered aphrodisiacs? Fresh Fairtrade Frankincense Frereana, Natural Chewing Gum, Incense and Medicine. The material I used in this distillation is the same oleoresin I sell in my Etsy shop. It is fresh 2013 co-op harvested in the mountains of Somaliland by a group of traditional harvester families who have passed care of the trees down from generation to generation for many decades. The harvesters are traditionally locked in to the low prices, unscrupulous practices of foreign buyers and middlemen. These buyers dominate the local market and offer harvesters a minimum return to keep their own profit as high as possible. The current arrangement is impoverishing for the harvesters, many become indebted to the middlemen. Till recently they have been completely dependent on these buyers for lack of alternative markets for their resins. Young Frankincense harvester bringing his day’s collection of resin down from dangerous rocky terrain. Everyone participates. Frankincense Frereana trees grow wild, often in the most inaccessible and precarious places. Injuries are a common occupational hazard and modern medical facilities non-existent for the mountain clans. Now, with the increase of global communication, travel and commerce coupled with heightened consumer awareness, new and more profitable markets are becoming available to them and some of the middlemen can be bypassed. This creates a better return for the harvesters, and a place where co-ops can shine. This is where we, the informed western consumer can make a difference with our purchasing power. We need to educate ourselves because we can make a difference with our individual and collective purchases. Our world is a beautiful little garden in a big universe. It is our very own Apothecary’s garden that gives us all of our medicine and fragrance, all our food and sustenance. We are each individually responsible for it, and it is up to us to tend to it any way we can. Somaliland is famous not only for its Frankincense Frereana, but also for its fine Frankincense Sacra/Carterii, Myrrh and Opoponax, (scented Myrrh), which this co-op also collects. The organizer of the co-op, B.H., inherited Frankincense and Myrrh trees from his family. Living in the west from a young age, he gave up his western citizenship and took responsibility for their care, harvest and sale. His co-op has grown to include other families and clans. He has built a small school, a clinic and purchased an “ambulance” for them. He helps get them out of debt to the buyers, and makes sure they receive a fair price for their resins. He coordinates the harvesting, collection and transportation of resins by camel and donkey from the mountains to the coast for sorting and grading, where the buyers await. There are no roads to these remote areas, though the footpaths are obvious after hundreds of years of trading Frankincense. He mediates between individuals, families and clans, sources markets, organizes shipping and deals with the inevitable red tape. It is a big job, one that requires dedication, passion and commitment. I realize I can’t personally right all the wrongs, be in all the places I would like to be, or make the world the kind of place I would like to live in, all on my own. However, I can support those people who are out there doing the work. Even if it is only in some small way. The combined power of many people choosing to educate and inform themselves about how their fragrance, medicine and food comes to them, coupled with small informed choices that reflect their values, is immense and world changing. We forget how much power we have with our choices, our small purchases, the combined clicks of our mouses. This is the silver lining to our capitalistic system. Our money does indeed talk, and it will say what ever we tell it to. I also wonder if the resulting oil i got have same benefits of dissolving the resin extract in your method in other oils , i don have access to frankincense essential oil where i love will this do the trick of the resin oil. By the way he frankincense i have dissolves very quickly in oil using stove very low heat . Im not sure what type i have though. Or use oil to to extract the resin and essential oil oil directly, you will, in both cases, have both the resin and the essential oil of the Frankincense with the same properties and benefits available to use as you wish. By your description of the Frankincense dissolving very quickly in the oil, I would guess you are using Frankincense Frereana or Maydi from Somalia. If this is the case, it would leave very little or no undissolved material behind after dissolving in the oil. Other types of Frankincense will leave behind about 30% in water soluble gum that will not melt in the oil. Thank you for your visit and your questions. It sounds like the methods you used worked well. I don’t recommend heating resins and oil directly on the stove top since they can easily burn and can also catch fire if one is not cautious. Also the essential oils will quickly evaporate at higher temperatures leaving you with mainly the resin portion of the Frankincense and much less fragrance at room temperature. If there was no residue left after the oleo resin dissolved in the oil then you likely used Boswellia Frereana, or Maydi from Somalia. Mixing your frankincense resin oil with other oils or a body cream are excellent ways to use the medicinal and cosmetic properties of the Frankincense! Good work!! Hi Dan, I am a novice distiller and have some questions that I hope you will be willing to answer. I live in your old stomping grounds so I am interested in distilling Abies balsamea sap aka gomme de sapin and pines. I have two copper alembics. One I use for hydrosols (using green plant material) and the other for alcohol. Can I run a distillation in the hydrosol still with the resin or will it “season” the apparatus in an undesirable way? Do I mix the liquid Abies resin in with the water and if so, what are the propoptions? Finally, I am most interested in obtaining the ROsin from this distillation to use in incense. Will the solid rosin, separated from the water, be at the bottom of the pot? Do I have to act quickly to remove it? Thank you for any time you give to my questions since I am not working with a mentor. Thank you for your questions, I’ll answer them as I can from the bottom up. The pure rosin will stay separate from your distilling water and you need to pour it out while hot at the end of your distillation. You have a few minutes to disassemble your albemic and set aside your receiver,but the hotter it is the more liquid the mass of rosin will be. You could simply pour it into a bucket and wait for the rosin to cool. Once at room temperature it should be quite solid so you can collect it and filter it. This you can easily do with a water-bath. Put all your resin pieces in a separate container in the bath, when the bath is boiling and the rosin is again liquid, pour it through a filtering material such as a clean pillowcase. You can at this time also pour it into moulds of your choice or simply into a clean pan to be fragmented when cool. I often use proportions of 1 part sap to 3-5 parts water. Make an accurate note of how much water is in your receiver as you go along and you will know exactly when to end your distillation. Keep in mind you can get about 10% of your distilling material in essential oil if it is fresh. I usually heat my water first, then, when hot add my oleoresins. I don’t know if it will season your copper albemic, I don’t think it will. However you must have an albemic that has a decent sized opening so you can clean out any residue by hand. Alcohol will do a good job removing any trace of resins, or dissolving any residue with vegetable oil, then scrubbing with soap and water, is also a good alternative. I hope I answered most of your questions. Please let me know if I can be of further help. Hi Moustafa, and thank you for visiting. The yield I drew from 3 Kg. of Boswellia Frereana was 180 Ml., or 60 Ml. per kilo. Roughly 6%. Thank you for your visit and contacting me. I loved this article! Thank you for sharing. I am an American businessman in the middle east. I am very interested in getting in touch with you about your contact in somali land who is working the co op. I want to visit him and help him in any way I can. cool. im going to try this. Thank you for this post, Dan! I will try distilling spruce sap directly in the water next time. Can imagine that the results are better. Yet another fantastic article. Thanks for the great read! So is this the highest quality of frankinsense to buy? This is simply a different type of Frankincense with its own unique qualities. I personally use it more than the other types, but that’s just me.